Aprilia is an Italian motorcycle company, which in recent times bought the historical Moto-Guzzi and Laverda brands. Aprilia started as a scooter manufacturer, but has more recently come to be known for its race-winning sportsbikes. It is most recently best known for its flagship 1000 cc V-Twin Superbike, the RSV Mille. 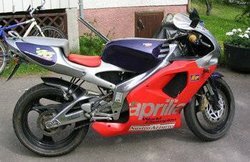 Aprilia was founded immediately after the Second World War by Cavaliere Alberto Beggio, as a bicycle production factory at Noale, Italy in the province of Venice. Alberto’s son, Ivano Beggio, took over the helm of the company in 1968 and he constructed a 50 cc "motorcycle" with a dozen or so collaborators. The first production Aprilia mopeds were named Colibrì, Daniela and Packi. Aprilia later produced a motocross bike in 1970 called the Scarabeo. 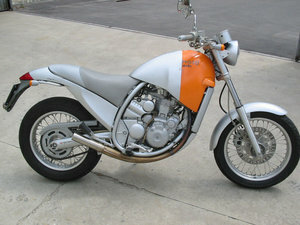 Produced until the end of the 1970s, the Scarabeo came in 50 and 125 cc versions. In 1977 Ivan Alborghetti from Milan, Italy won the Italian 125 and 250 cc motorcross championships on Aprilias. In 1978 Alborghetti closed the season with two third places in individual races and sixth place in the World Championship. In 1985, Aprilia started outsourcing engines for some models to the Austrian company Rotax. In 1985 Aprilia launched a 125 STX and 350 STX. In 1986 Aprilia launched the AF1; a small sports model, and the Tuareg; a large tanked bike for African rallies. In 1985 Aprilia rider Philippe Berlatier contended for the trials world championship reaching fifth place, and Loris Reggiani road an Aprilia GP 250 with Rotax engine to sixth place in the road racing World Championship. Two seasons later, on August 30, 1987, at San Marino Grand Prix in Misano Loris Reggiani’s AF1 won the first World Speed Championship. In 1990 Aprilia launched the Pegaso 600, a road bike derived from off-road mechanics. In 1992 Aprilia rider Alessandro Gramigni won the World 125 Road Racing Championship title. Also in 1992, Tommy Ahvala won the World Trials Championship on an Aprilia Climber. Since then, Aprilia has 124 times won 125 and 250 cc class Grand Prix, 15 Road Racing World Championship titles, and 16 European speed titles. Many world champions started on Aprilia such as Biaggi, Capirossi, Gramigni, Locatelli, Sakata and Rossi. Also in the 1990s, Aprilia entered the scooter market starting in 1990 with Italy’s first all-plastic scooter, the Amico. In 1992, Aprilia introduced the Amico LK and the twin cylinder Pegaso 125, both with catalytic converters. In 1993 Aprilia launched a large diameter wheel scooter reusing the name Scarabeo with a four-stroke, four-valve engine. Later Aprilia launced additional scooters such as the Leonardo, the SR and the Gulliver, to name a few. In 1995, Aprilia commission Philippe Starck to design the Motò which was shown in New York’s Modern Art Museum. Also in 1995 Aprilia launched the two stroke RS 125 and RS 250 sports bikes. 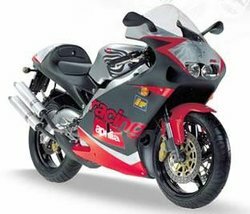 In 1998 Aprilia launched what is its current flagship model the RSV Mille, a 1000cc V-Twin Superbike, and the Falco, a 1000cc V-Twin sport tourer with emphasis on sport. Both bikes used a variation of a Rotax 1000cc engine. In 1999 Aprilia entered World Superbike Championship racing with its RSV Mille, and during 2000, Aprilia acquired Moto-Guzzi and Laverda, both historic heritage Italian marques. In 2000 Aprilia launched the 50cc DiTech (Direct Injection Technology) two stroke engine for scooters which provides high milage and low emissions, and also the RST Futura; true sport tourer, and the ETV 1000 Caponord; an "Adventure Touring Motorcycle" (also known by some as a "Trailie.") Both of these latter two motorcycles used a variation of the Rotax a 1000cc V-Twin. 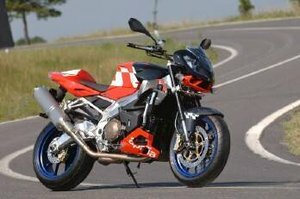 Most recently, in 2003, Aprilia launched the RSV Mille Tuono which was essentially an RSV Mille with motorcross-style high handlebars and only a small headlight fairing. Most of the major motorcycle magazines picked it for the best bike of the year. With the acquisition by Piaggio, the newly nominated President of Aprilia is Roberto Colaninno (President of Piaggio & C.), and the Managing Director is Rocco Sabelli. The founder, Ivano Beggio, is the Honorary President. Gábor Talmácsi, 2007 125cc World Championship winner, aboard his Aprilia RS125 racebike. 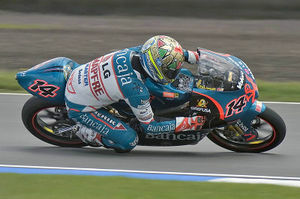 Despite being a relatively small company by global motorcycling standards, Aprilia is very active in Motorcycle sport. It contests many Road Racing formulae, including the FIM 125 cc World Championship, the FIM 250 cc World Championship, and the now-defunct FIM 500 cc World Championship. From 2002–2004 they participated in the FIM MotoGP World Championship, and from 1999–2003 they participated in the FIM Superbike World Championship. Aprilia has now returned to World Superbike for the 2009 season with Max Biaggi and Shinya Nakano as their factory riders both piloting the RSV4. Aprilia Racing has seen varying successes. They were extremely successful in the smaller displacement categories, winning numerous races & championships in the 125 cc Grand Prix and 250 cc Grand Prix classes. However, their 500 cc Grand Prix bike was less competitive, and their MotoGP effort, dubbed the RS3 Cube, was technically advanced but difficult to ride and performed poorly in the championship. The Cube did, however, feature many advanced technologies either not seen or only being seen now in other MotoGP bikes - technologies including fly by wire throttle and pneumatic valve actuation systems. They were 3rd in manufacturers points and 2nd in rider points in the Superbike World Championship 2001 with rider Troy Corser. This was their high water mark for that series. They used a homologation special version of their road bike the RSVR Mille. The motor for the racebike was specially built by Cosworth. In 2006 & 2007 in they dominated the 250 class of motogp, partly due to the ability of Jorge Lorenzo, partly to the excellent quality of the 250 motorcycle. Aprilia also feature in the off-road racing world, with their 450 cc V2 motocrosser producing respectable results (including race wins) in both off-road (Motocross) and on-road (Supermoto) categories. The company is also notable for choosing somewhat atypical engine configurations. For example, they progressed with development of a V2 500 cc Grand Prix bike when other teams were moving to V-Four configurations for what some believed was better & more usable power outputs. Aprilia continued this trend, taking advantage of lighter minimum weights with the introduction of their RS3 MotoGP bike - featuring three cylinders in an inline triple layout, the bike had the least number of cylinders on the Grand Prix paddock. Yamaha had gone ahead with an inline four layout, whilst Suzuki and Ducati went for (differently-designed) V-Four layouts. Honda took the idea even further, producing the championship-winning RC211V, powered by a V5 cylinder engine. In February 2008, Aprilia debuted a V-4 superbike the RSV 4 for the 2009 Superbike World Championship season. Aprilia is also an industrial town in southern Latium, between Rome and Latina.